Recently I posted about my mentor, Cathy Fleischer, and how she’s taught me to participate in the professional conversation about ELA. Another mentor who invited me to participate in the professional conversation is Ed Pembleton, former director of the Leopold Education Project, who now works with the Jeffers Foundation, doing workshops to enable and encourage teachers to take their students outdoors. I first encountered the LEP when Ken Bollinger, the Agriculture instructor at the Lenawee ISD, held an LEP educator workshop at the Stubnitz Nature Center in Adrian, MI. It was powerful and life-changing professional development, not only for me, but for students. LEP showed me that I could break down the walls between the disciplines in my classroom and give my students a rich, holistic, community-focused and student-centered ELA classroom. In spring of 1999, I taught my 1st LEP lesson in my eleventh-grade literature classes. Using the “The Good Oak” essay from Aldo Leopold’s A Sand County Almanac as a springboard, I invited students to write a history from a plant’s perspective. I still remember the astonishment I felt when I read those first papers. Thinking about Leopold’s essay and looking at a plant allowed students to write moving and beautiful pieces. One student wrote the family’s history from the perspective of a plant that had come from a grandparent’s funeral, acknowledging the changes that had occurred in the family and recognizing the ways that they missed and loved their dearly departed elder. Another wrote a family history told from the perspective of the tree that was planted with the placenta after the student’s birth. I remember being astonished and excited that the exercise brought forth such lively, lovely, and powerful writing. I knew I was onto something. I was AMAZED at the possibilities that were opened to me as a teacher with LEP. I immediately set about to introduce inquiry methods to my classes and to re-design my curriculum to be more student-centered and inquiry-focused. As soon as I could, I attended a facilitator workshop, so I could learn to empower other educators to do the same. That’s where I met Ed Pembleton. At the time, he was the director of the LEP. Since then, I have counted him among my most influential mentors, along with his lovely wife, Sil. The Pembletons, like me, aren’t simply teachers. They have been classroom teachers, and they have been professional development facilitators, and they have been trip leaders, but they are so much more than that. They are immersed in the ideas and principles of Aldo Leopold and the Land Ethic. Both former classroom teachers, they have spent a lifetime helping people of all ages and from every background to strengthen their love for land by having a great time in the outdoors, learning, laughing, and loving land and all the beings that depend on it. Ed and Sil have been tremendously supportive of my efforts to offer students a student-centered, inquiry-based experience that strengthens their connection to nature, allows them choice over audience and purpose in their writing, and contributes to their overall well-being. And, as I shared the work that the LEP had inspired in my students, Ed and Sil saw that it was powerful. As director of LEP, Ed published a monthly newsletter that went out to LEP educators and facilitators called Strides. It was there that I published for the first time as an educator–along with one of my students, Kelsey Jacobs. I still treasure that newsletter, where a young girl wrote about her developing Land Ethic, and I wrote about helping students like her begin to think about their relationship to land and what it means in terms of ethics. Those compositions are POWERFUL. I have seen grown adults moved to tears over the writing of high school juniors. It never fails that when I take out those projects and let other educators see what my students created, someone asks, “HOW OLD are these kids?” Time and again, adults have been astonished that students can write so powerfully and beautifully. By now, those projects have been read and enjoyed by hundreds of educators around the country, in LEP workshops I’ve facilitated, and in those facilitated by Ed and Sil. One time Ed sent me this message, which totally made my day: “We were in a workshop down in the southwest part of Minnesota the last couple of days. We had one social studies instructor whose teaching technique was so refreshingly focused on critical thinking skills and the use of original source materials that we referred to him as ‘the lisa eddy of social studies.’” It amazes me and fills me with joy to know that the students who sat in my classes years ago are teaching teachers around the country–because Ed and Sil share their work with LEP participants. Over the years, Ed has continued to mentor and encourage me as a classroom teacher and LEP facilitator. It was Ed who recommended that the Wood-Lucas County (OH) Pheasants Forever chapter contact me to do LEP educator workshops in the Bowling Green area, where I became a member of the “Dream Team” of LEP presenters, along with Kim Kaseman, Rachel Starnes, and Don Schooner. For years, we offered educator workshops in conjunction with a youth pheasant hunting excursion that brought hundreds of children and parents together with teachers to do a fun outdoor activity that would introduce them to Leopold and the Land Ethic. Ed, Sil, Don and Kim are so much more to me than colleagues and PD presenters; our shared passion for land, literature, the arts, and education have created a bond that feels more like family. 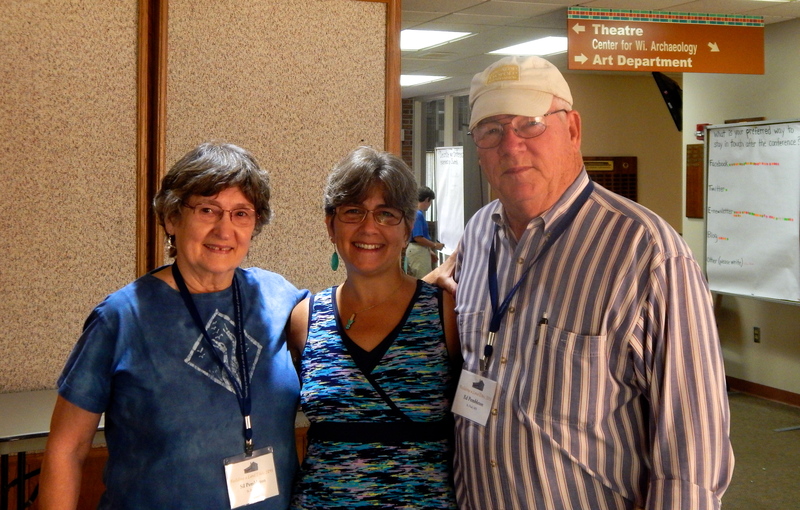 I am overjoyed to be reunited with my LEP family at the Building a Land Ethic Conference 2015 in Baraboo, Wisconsin. Today we’re taking field trips: to the International Crane Foundation, the Leopold Shack, and The Leopold Center. I am excited to learn more about Building a Land Ethic that includes all, and I am grateful to have such incredible colleagues and mentors to shape my land ethic and my pedagogy. In a time when educational “reforms” focus are dehumanizing school through standardized curricula and toxic testing, LEP offers teachers a way to honor our humanity, the land, and life itself. Thank you, LEP, and thank you, Ed and Sil Pembleton, for being the gracious, kind, caring teachers and mentors that you are. I and my students owe you a debt of gratitude. 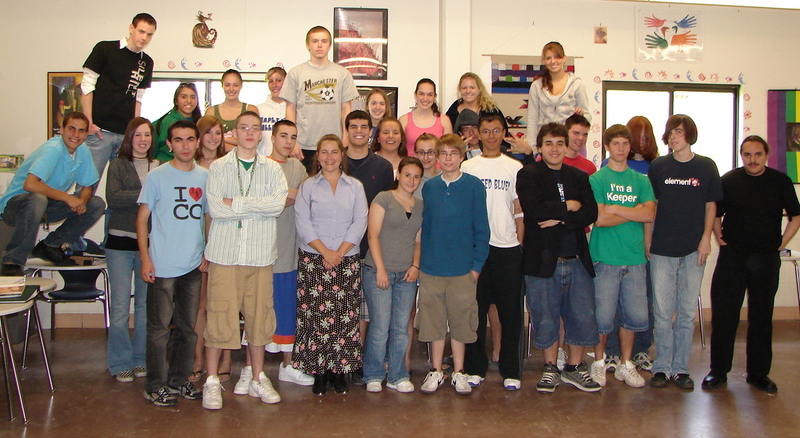 American Literature 11 class, 2005-06, the year I earned my Masters’ degree and published Place-Based Play Space. Go Maples! ← What’s It Like To Have Summers Off?